The prolonged conflict during WW1 had taken its toll on the country and its resources. Ancillary services of the Army were virtually non-existent. The standard weapons were outdated by a generation. The latter was mainly caused by the British paranoia of not making the Indian Forces too strong as they may work against the British interests one day. This stemmed from the uprising of 1857. And consequently, heavy artillery could only be manned by the British. There was no Mechanical Transport or Air Force. Mechanical equipment was of inferior quality with respect to machine-guns, artillery, hospital equipment and medical establishments. After an in-depth review of the shortcomings, military advisers pushed for reorganization and reform. 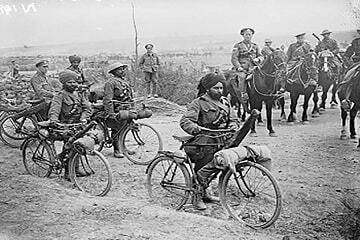 Although the war may have been over for most of the world, Indian units were still serving overseas till as late as 1921 and the Indian Army was also engaged in the Third Afghan War in 1919. Thus the proposed changes could not be effected immediately after the armistice. Nonetheless, the changes were gradually being implemented throughout 1921 and 1922. Mechanical Transport and Signal services were added. The artillery arm was reorganized as were the infantry battalions which were now grouped in multi-battalion regiments. This was essentially done as single battalion regiments which were maintained from depots constituted from the units themselves had failed as a system both in terms of recruitment and training. A new system was devised in 1922 to relieve combatant units of the training of recruits in both peace and war. The new recruits could now be trained by a regiment’s ‘Training Battalion’ thereby allowing for continuity of unit administration. During the war, there were also calls by the Indian intelligentsia to allow commissioning of Indians as officers in the Indian Army. They wanted the Indian Army to be truly ‘Indian’ and not just in name. Prior to the war, the highest rank that an Indian could reach was that of Subadar-Major in the infantry and Risaldar-Major in the cavalry, both of which were below the junior-most rank of British officers. This new changes led to the ‘Indianisation’ of officers in a limited way but gradually, the intake of Indian officers was increased over time and by the time the Second World War came about, there were a large number of Indians serving as officers. The Great War, in effect, brought about some monumental changes in several aspects of the Indian Army and for the most part, these changes were a step in the right direction. Many of the short-comings faced earlier were overcome as a result of this and these changes laid the foundations for the professional development of the independent armies of India and Pakistan.